All the embedded “WAN” ports are Gigabit Ethernet uplinks. Good. They claim up to 5-times higher performance than the previous routers. Average. 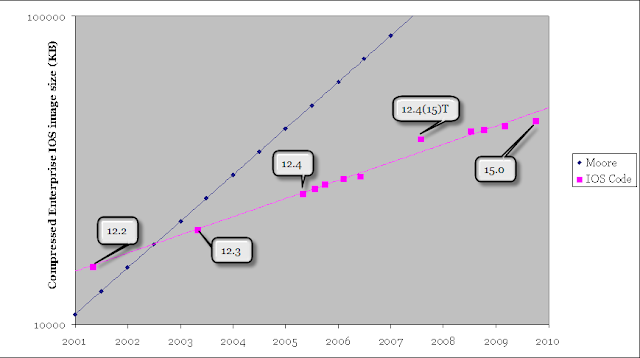 The ISR series was launched in 2004 and Moore’s law predicts 5.8-times increase. Lots of the old interface modules are supported. Amazing; I’m just hoping it doesn’t hurt the performance. They’ve replaced the old half-hearted attempts to include an x86 generic application platform within a router with the Service Ready Engine (another great marketing invention … sounds so much better than a Linux blade) modules, having up to 4GB of RAM and 1TB of hard disk. I don’t want to know how the people who bought the old AXP platform feel reading these specs. However, one of the most important changes from the network manager perspective is the unified IOS image. No more hassle in the image selection process: you have a single image that contains all the function you’ll ever need. If your quality control process requires IOS image lab tests, you can do it once regardless of which features you need. When you need to deploy additional functionality, you just order new license, enter it in the router and start using the new features. I’m positive someone will try to position the unified IOS image as the next best thing since the invention of sliced bread. However, it’s yet again a simple result of Moore’s law; the IOS developers were not able to develop the code fast enough to keep with the dropping DRAM/Flash prices. All the memory needed for the “kitchen-sink” image of today costs less than the IP base image in days when IOS 12.2 was released. Actually, the official name for the kitchen sink image is Advanced Enterprise Services, but those of you who have been in the business long enough know probably still remember what the –k- acronym in the IOS image name stood for. To make my findings a bit more “scientific”, I’ve tried really hard to find out when individual IOS releases were launched and produced a graph comparing Flash image sizes of compressed high-end IOS images (ENTERPRISE/FW/IDS IPSEC 3DES or Advanced Enterprise Services) with the exponential curve predicted by the Moore’s law based on compressed 12.2 IP Plus image (the smallest image for the 7200-series router I was able to find). The image sizes were taken from CCO download area. I’ve used the images for the 7204 router to eliminate the potential impact of changed CPU instruction set. In some cases, I was not able to find the “original” images, so I’ve assumed the mainline IOS image size did not increase significantly during its maintenance period. It is a good news from exploit developer, it'll be easier to get exploitable pointer. Of course it will take few years to be wide spread. so first I don't see any improvements and then I don't understand this "100 Mbps"
I'm really hoping Cisco will have the decency to release free or low-cost "educational" licenses for IOS under this new scheme. Ideally these would enable all features yet cripple throughput to perhaps 10 Mbps (or less). It would also be nice to see them move away from compressed images. Image decompression accounts for a significant portion of boot time, and Flash is so cheap these days there's really no reason for it. The video was a good laugh! On day Win7 was available worldwide on the market, I almost heard about 30 times the words "Windows 7" in my car on the radio in the morning.